Africa’s richest fossil hominin site has revealed more of its treasure. 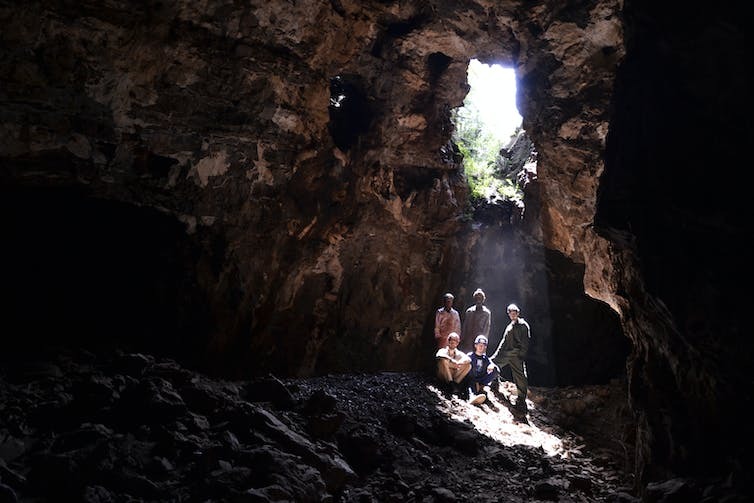 It’s been a year and a half since scientists announced that a new hominin species, which they called Homo naledi, had been discovered in the Rising Star Cave outside Johannesburg. Now they say they have established and published the age of the original naledi fossils that garnered global headlines in 2015. Homo naledi lived sometime between 335 and 236 thousand years ago, making it relatively young. They’ve also announced the discovery of a second chamber in the Rising Star cave system, which contained additional Homo naledi specimens. These include a child and the partial skeleton of an adult male with a well-preserved skull. They have named the skeleton “Neo” – a Sesotho word meaning “a gift”. The Conversation Africa’s Science Editor Natasha Joseph asked Professor John Hawks, a member of the team, to explain the story behind these finds. To an ordinary person, 236 000 years is a very long time ago. Why does the team suggest that in fact, Homo naledi is a “young” species? The course of human evolution has taken the last seven million years since our ancestors diverged from those of chimpanzees and bonobos. The first two-thirds of that long history, called australopiths, were apelike creatures who developed the trick of walking upright on two legs. Around two million years ago some varieties of hominins took the first real steps in a human direction. They’re the earliest clear members of our genus, Homo, and belong to species like Homo habilis, Homo erectus and Homo rudolfensis. Homo naledi looks in many ways like these first members of Homo. It’s even more primitive than these species in many ways, and has a smaller brain than any of them. People outside our team who have studied the fossils mostly thought they should be around the same age. A few had the radical idea that H. naledi might have lived more recently, maybe around 900,000 years ago. Nobody thought that these fossils could actually have come from the same recent time interval when modern humans were evolving, a mere 236 to 335 thousand years ago. How do you figure out a fossil’s age? We applied six different methods. The most valuable of these were electron spin resonance (ESR) dating, and uranium-thorium (U-Th) dating. ESR relies on the fact that teeth contain tiny crystals, and the electron energy in these crystals is affected by natural radiation in the ground over long periods of time after fossils are buried. U-Th relies on the fact that water drips into caves and forms layers of calcite, which contain traces of uranium. The radioactive fraction of uranium decays into thorium slowly over time. So the proportion of thorium compared to uranium gives an estimate of the time since the calcite layers formed. One of these calcite deposits, called a flowstone, formed above the H. naledi fossils in the Dinaledi Chamber. That flowstone helps to establish the minimum age: the fossils must be older than the flowstone above them. For these two methods, our team engaged two separate labs and asked them to process and analyse samples without talking to each other. Their processes produced the same results. This gives us great confidence that the results are reliable. What does the discovery of Homo naledi’s age mean for our understanding of human history and evolution? For at least the past 100 years, anthropologists have assumed that most of the evolution of Homo was a story of progress: brains got bigger over time, technology became more sophisticated and teeth got smaller as people relied more upon cleverness to get better food and prepare it by cooking. We thought that once culture really got started, our evolution was driven by a feedback loop – better food allowed bigger brains, more clever adaptations, more sophisticated communication. That enabled better technology, which yielded more food, and so on like a snowball rolling downhill. No other hominin species could compete with this human juggernaut. You would never see more than one form of human in a single part of the world, because the competition would be too intense. Other forms, like Neanderthals, existed within regions of the world apart from the mainstream leading to modern humans in Africa. But even they were basically human with large brains. Africa south of the equator is the core of human evolutionary history. That’s where today’s human populations were most genetically diverse, and that diversity is just a small part of what once existed there. Different lineages of archaic humans once lived in this region. Anthropologists have found a few fossil remnants of these archaic populations. They’ve tried to connect those remnants in a straight line. But the genetic evidence suggests that they were much more complex, with deep divisions that occasionally intertwined. H. naledi shows a lineage that existed for probably more than a million years, maybe two million years, from the time it branched from our family tree up to the last 300,000 years. During all this time, it lived in Africa with archaic lineages of humans, with the ancestors of modern humans, maybe with early modern humans themselves. It’s strikingly different from any of these other human forms, so primitive in many aspects. It represents a lost hominin community within which our species evolved. I think we have to reexamine much of what we thought we knew about our shared evolutionary past in Africa. We know a lot of information from a few very tiny geographic areas. But the largest parts of the continent are unknown – they have no fossil record at all. We’re working to change that, and as our team and others make new discoveries, I’m pretty sure we are going to find more lineages that have been hidden to us. H. naledi will not be the last. The first Homo naledi discoveries were made in the Dinaledi Chamber. What led researchers to the second chamber? And what did you find there? The Dinaledi Chamber is one of the most significant fossil finds in history. After excavating only a very tiny part of this chamber, the sample of hominin specimens is already larger than any other single assemblage in Africa. The explorers who first found these bones, Rick Hunter and Steven Tucker, saw what the team was doing when they were excavating in the chamber. The pair realised that they might have seen a similar occurrence in another part of the cave system. The Rising Star system has more than two kilometres of mapped passages underground. In another deep chamber, accessed again through very tight underground squeezes, there were hominin bones exposed on the surface. Our team first began systematic survey of this chamber, which we named the Lesedi Chamber, in 2014. For two years Marina Elliott led excavations, joined at times by most of the team’s other experienced underground excavators. They were working in a situation where bones are jammed into a tight blind tunnel. Only one excavator can fit at a time, belly-down, feet sticking out. It is an incredibly challenging excavation circumstance. The most significant discovery is a partial skeleton of H. naledi, with parts of the arms, legs, a lot of the spine and many other pieces, as well as a beautifully complete skull and jaw. We named this skeleton “Neo”. We also recovered fragments of at least one other adult individual, and one child, although we suspect these bones may come from one or two more individuals. Is there a way for people to view these discoveries in person? On May 25 – Africa Day – Maropeng at the Cradle of Humankind World Heritage Site outside Johannesburg will open a new exhibit with the discoveries from the Lesedi Chamber and the Dinaledi Chamber together for the first time. For people outside South Africa, the data from our three-dimensional scans of the new Lesedi fossils are available online. Anyone can download the 3D models, and people with access to a 3D printer can print their own physical copies of the new fossils, as well as the fossils from the Dinaledi Chamber. It’s a great way for people to see the evidence for themselves.